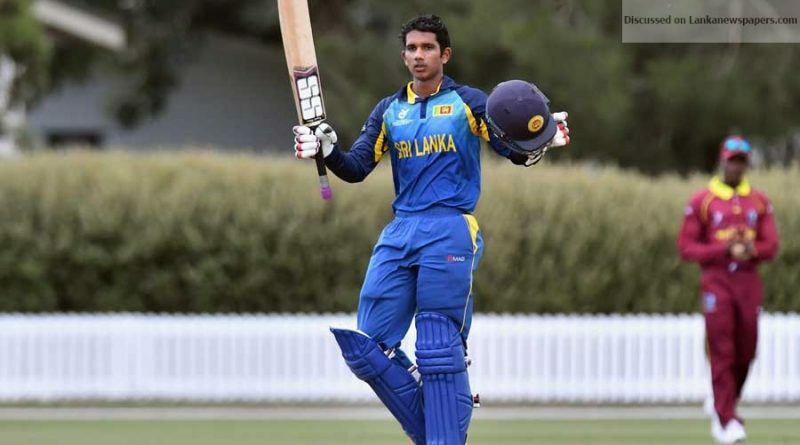 Hasitha Boyagoda, Sri Lanka’s under-19 opener whose blistering 191 at the Youth World Cup caught the world’s eye, was sidelined once again by Team Kandy during the ongoing Sri Lanka Cricket (SLC) Inter Provincial One Day Tournament, which has now reached the semi-final stage. The masterful opener who is a product of Trinity College Kandy, has been in good nick since the World Cup hammering two centuries, and continued his good form during the domestic school tournament, but Team Kandy has failed to give him exposure at the next level. There are a number of under-19 players in the ongoing Provincial level tournament, namely: Kamindu Mendis, Nishan Madushanka, Ashen Bandara and Jehan Daniel, but Kandy continues to sideline Boyagoda. Boyagoda let his bat do the talking when he was sidelined from the SL under-19 team during the World Cup. He hammered a record-breaking 191 when he was given the chance, followed by another century in the last match. His good form continued after he returned to the domestic circuit, where he scored a century in their big match. But he is yet to be given the necessary exposure in the Provincial team, where he has been warming the bench for too long, watching Kandy lose four out of their five matches in the tournament. Earlier SLC boasted about the inclusion of under-19 players in the Provincial squads and said they will get much needed experience from the tournament. Several teams decided to give exposure to under-19 players in their team and they delivered whenever they were given the opportunity. However, the most successful opener of the SL under-19 team is yet to get a single match, even though Kandy has used five openers so far in the tournament. In contrast, India has included their under-19 players in the Indian Premier League (IPL) and given them exposure at the next level, which is going to come in handy when those players graduate to play for the National team, while also giving the youngsters an opportunity to showcase their talent for the selectors. According to the National selectors, it’s the job of each coach, manager and captain of Provincial teams to select the 15 and playing 11 after selectors named the Provincial squads. Next up will be the semi-final of the tournament where Kandy will take on Dambulla tomorrow. Kandy got an opportunity to play in the semi-final even after losing four matches out of five only because there are four teams in the tournament.